John Hoyland (1934–2011) was an important English abstract painter whom the English are still trying to get a handle on, and whom almost no one in America knows anything about. By the time he worked on the paintings in this exhibition, John Hoyland: Stain Paintings 1964 – 1966 at Pace (September 25 – October 21, 2017), his work had undergone a number of significant and radical changes. For four years, starting in 1960, Hoyland ventured into territory that we associate with Bridget Riley (optical geometry) and Frank Stella (stripes). In 1964, he came to New York and met Robert Motherwell, Barnett Newman, and Mark Rothko, whose exhibition at the Whitechapel in 1961 made a deep impression on him. While many have focused on Hoyland’s American connection, as if his paintings had all sprung from that fountain, he achieves something all his own in his “stain paintings,” and it is remarkable how strong they look more than 50 years after they were made. There are six paintings in the show and five of them are at least 10 feet high or wide; they are post-easel paintings done in acrylic. Hoyland was not interested in symmetry, balance, all-overness, chevrons, monochrome, a mechanical look, or modular repetition — which are all characteristics of American abstract paintings being done at the same time by artists such as Kenneth Noland, Frank Stella, and Ellsworth Kelly. His hard edges aren’t taped. When a solid plane bleeds into the area adjacent to it, I get the feeling that Hoyland had done a lot of watercolors, which his American peers would have frowned upon. Another thing that struck me is how much Hoyland liked to use green in this group of works. He liked lime green, Veronese green, military green, sea green, and grass green — which does call up nature — and he did not feel compelled to underscore two-dimensionality or eschew ambiguity. Proving the painting’s flatness with frontal shapes or solid stripes must have seemed superfluous or monotonous to him; he wanted movement; he wanted your eyes to dance and skitter across the painting, where the ground might be mottled or solid, where the shifts of color and surface pull you closer, where the space between the planes and vibrate or smolder, where color intensities vary considerably. In “7.11.66” (1966) and “3.12.65” (1965), the intervals of the angled planes, as well as their orientation toward the painting’s picture plane, move attention in and out of a space that is saturated with color. The solid planes of color blur along the edges. 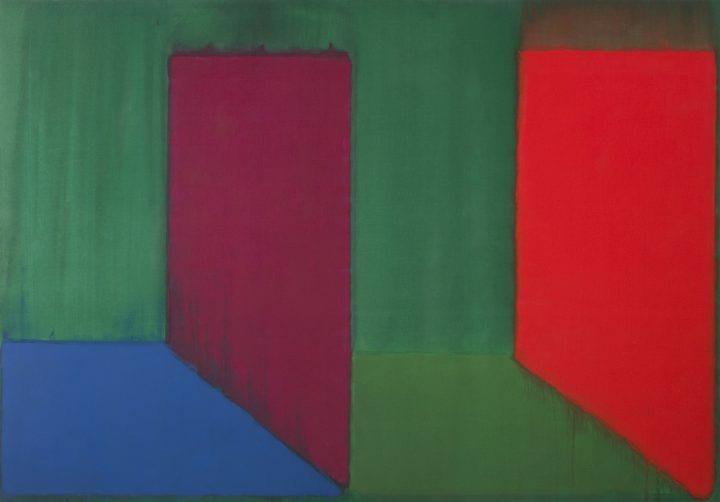 In “7.11.66,” Hoyland underscored the optical tension between red and green, mediated by violet and blue planes. The spatial effects and the changing intensities of the optical vibrations are very different from anything going on in American abstraction from this or any other period. Seeing becomes a sequence of instances bumping against other instances, always changing. For Hoyland, looking was not static. Sometimes the saturated fields hum, other times they throb. Hoyland did not make calm or meditative paintings; they certainly didn’t induce calm in this viewer. In “7.11.66” and “3.12.65,” the intervals are as important as the angled planes, which introduce a visual tension into their relationship. And if we are tempted to think of these large paintings as landscapes, especially the horizontal ones whose planes are angled to the expansive picture plane, they are landscapes that are made of paint and color, planes and light. The paintings are austere and saturated, pared down and, like the bleeding planes, bursting at the seams. When we think of postwar English painting, we think of Francis Bacon, Leon Kossoff, Frank Auerbach, or Lucian Freud — expressionist figurative painters. When it comes to abstraction, we know about Howard Hodgkins but not about Hoyland or, for that matter, William Tillyer and others. Something is wrong with this picture, as they used to say to you in grade school: what? 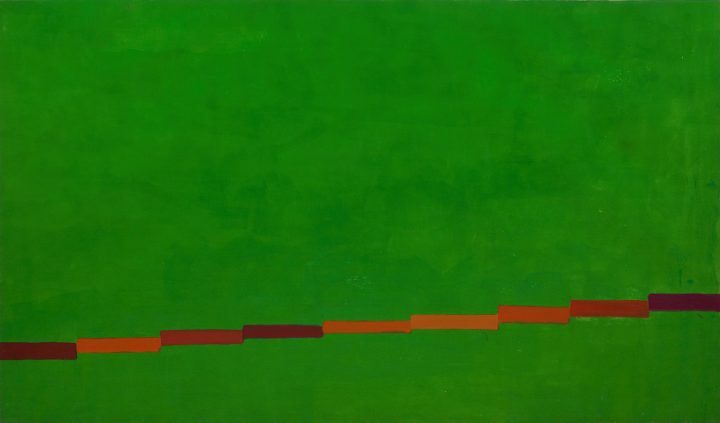 In the painting “11.10.64” (1964), a series of stepped bars of varied violets starts on the lower left side and extends across the green, stained field, ascending ever so slightly, until it intersects the painting’s right side. Red-earth-colored bands change in tonality and density; they are brushstrokes and they are not brushstrokes. They move across the surface much more slowly than a Barnett Newman “zip” or a Gene Davis stripe. They are like elongated bricks that defy gravity; they are floating and not floating. 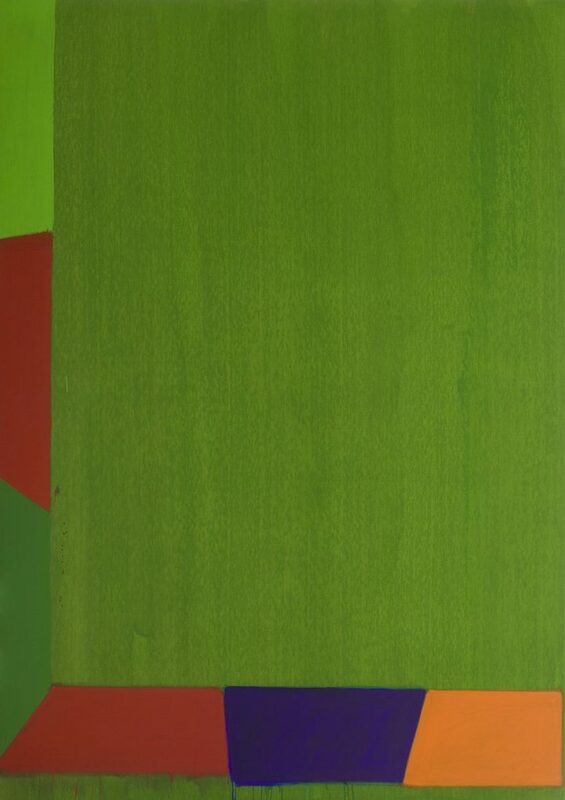 There is something direct and whimsical, forthright and imaginative about this painting that anticipates works done by Thomas Nozkowski, as does the vertical painting “7.65” (1965), where a band of different solid colors move across the bottom and left side of the painting, partially framing the mottled green field. The dance between solid plane and intensely colored light (saturated color) is a dissonant syncopation. Things keep changing when we begin looking, never becoming frozen or still. Movement and changes unfold through pared down means. 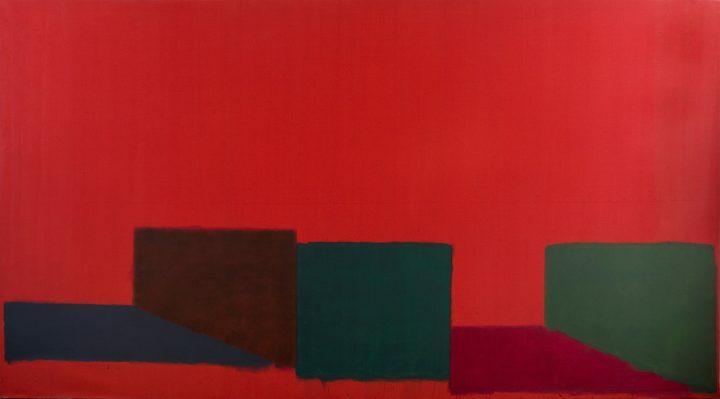 There is a simple, solid grandeur to these paintings that surprised me, having not encountered Hoyland’s work until now. A number of very good English abstract artists I know have talked to me about him over the years. Now I see why. American painting influenced him but he became a great English abstract painter. He took the prevailing opticality of the early 1960s into an entirely new and unexpected place. John Hoyland: Stain Paintings 1964 – 1966 continues at Pace (32 East 57th Street, Midtown, Manhattan) through October 21.